The Range Rider Pilot Project, a collaborative effort between Conservation Northwest and seven ranchers grazing cattle in areas of Eastern Washington occupied by six different wolf packs in 2015, has previously produced three years with no livestock lost to wolf conflicts in our project areas. This effort seeks to demonstrate the effectiveness of non-lethal measures in deterring or reducing conflicts where wolves and livestock overlap in Washington, keeping cows and wolves safe and building social tolerance for these native predators. In 2015, our ranching partners experienced three livestock depredations, the first wolf-cattle conflicts confirmed within our project areas. Two depredations occurred in Kittitas County in the area of the Teanaway Pack. Another occurred in Stevens County in the area of the Smackout Pack. However, we believe the most recent field season was a success. Along with our ranching partners, we understand that range riding and other nonlethal deterrence methods are not always going to be 100 percent successful where livestock and predators share territory. The goal is to promote coexistence and reduce conflicts as much as possible. Get our take on wolf recovery. Read our talking points on wolves in Washington. “In past years we’ve had outstanding success with our range rider program with all the ranchers involved. Yet, we always knew a time would come when no matter how much non-lethal work was done, a depredation could occur. 2015 was the year that happened, and two ranchers working with our project experienced losses,” said Jay Kehne, our Conservation Associate and Range Rider Pilot Project manager based out of Okanogan County. “But two cows and one calf lost during a project season that included seven ranchers, eight public land grazing allotments and thousands of cow-calf pairs on hundreds of thousands of acres within the territory of six Washington wolf packs, that doesn’t make the Project or herd supervision failures when it comes to reducing conflicts between wolves and cattle,” says Kehne. Kehne notes that while we do not take these losses lightly, and neither do the ranchers we partner with, it’s important to realize that to ranchers in Idaho, Montana, and Canada, where wolves have been back on the landscape for decades or longer, losing one or two cows to predators in a season in these circumstances is considered a success. This is a practical definition of success that in the past we have not had to experience or accept here in Washington in regards to wolf conflicts. But it’s one that will sometimes be the reality going forward where wolves and livestock overlap on large public land grazing allotments. What’s more, the 2015 conflicts within our project areas did not lead to habitual depredation behavior from the wolves, likely due in part to the removal of the livestock carcasses and ramped up range riding shortly after the conflicts occurred. Jay checking in with one of our ranching partners. Sam Kayser, our ranching partner in the Teanaway, shared similar perspectives in an August Seattle Times article. “I want to believe there’s room for all of us…I don’t feel it’s a failure. It doesn’t mean I like it, but it’s just one loss in four or five years,” Kayser said after the first of his two livestock loses to wolves during the 2015 grazing season. 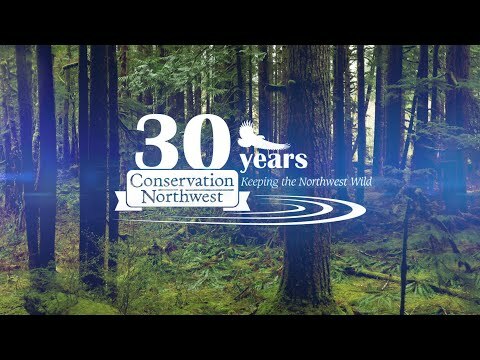 In addition to the collaboration with Conservation Northwest, the ranchers we partner with have livestock damage prevention agreements with the Washington Department of Fish and Wildlife (WDFW). These WDFW agreements are also designed to help fund and implement preventative measures, such as calving on fenced property, using range riders to increase human presence, and the removal of sick or dead livestock to avoid attracting predators. Ranchers with damage presentation agreements who experience losses to wolves receive compensation from the state for the value of their losses. Washington ranchers without damage prevention agreements can also receive compensation for livestock lost to wolves provided they supply documentation of measures designed to prevent and resolve conflicts according to a checklist provided by the Department. The goal of our Range Rider Pilot Project and our work on wolves is for Washington to be the state where wolf recovery, conservation and management works in the long run, for people, wolves and all the Northwest’s wildlife. But to achieve this goal it will take hard work, respect and compromise from stakeholders on all sides. And along with state and federal wildlife agencies we are working with these ranchers to hopefully avoid repeat depredations during the upcoming grazing season and continue our efforts with our partners in several other territories. The 2015 grazing season served as a reminder that the road to coexistence between people, livestock and predators is not easy. But these experiences are an expected component of a balancing act between people, livestock and predators sharing the same space.